The International Tennis Federation (ITF) announced the first four recipients of the 2010 Fed Cup by BNP Paribas Heart Award　on April 21st, and Kimoko Date was one of the players chose from the Asia Oceania Zone Group. 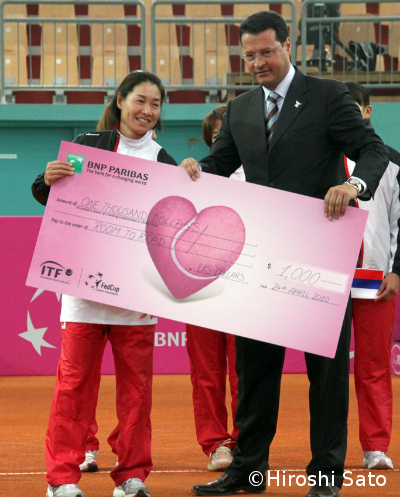 The Fed Cup by BNP Paribas Heart Award is a joint initiative between the ITF and BNP Paribas. It aims to recognise players who have represented their country with distinction, shown exceptional courage on court and demonstrated outstanding commitment to their team. Following the Fed Cup by BNP Paribas ties in February, ten players were shortlisted by the Heart Award judging panel in four categories. Each winner receives a cheque to be donated to a chosen charity, and Kimiko chose Room to Read to be the recipient of the full US$1,000, to support the implementation of its programs.